Heading for our first house sit for a little while, we arranged a stop of on the way to see the sights of Winchester. We weren’t disappointed. Having only a brief knowledge of what was in store we were surprised by how much there was to see in a relatively small city centre area. Good job really because the heatwave was persisting. Our Airbnb was just around the corner from what is now called Peninsula Square. 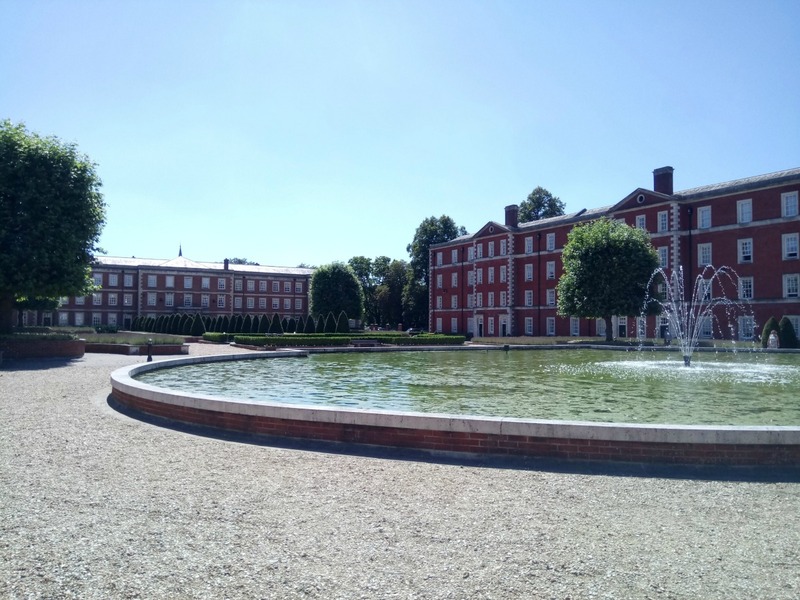 The impressive buildings around the square are former barracks that have now been converted into high spec apartments and houses. 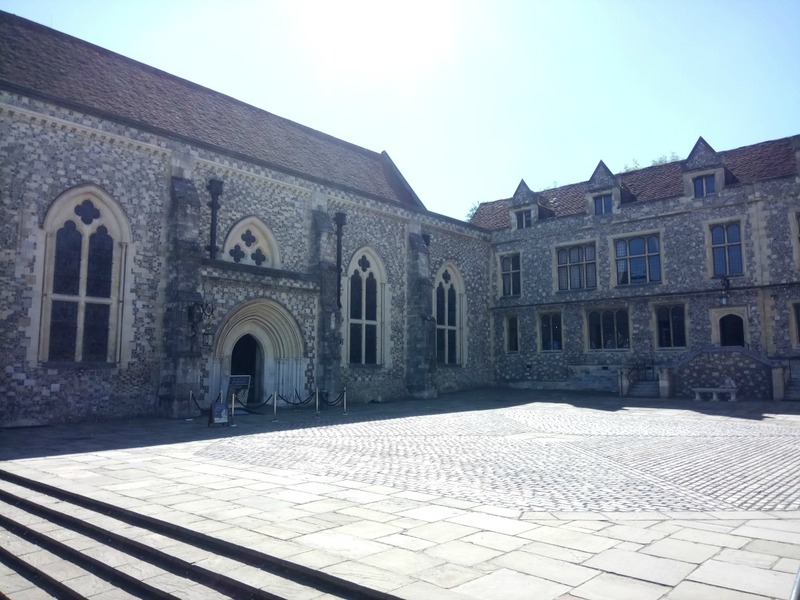 Some of the buildings have been retained as museums for various regiments associated with Winchester. After a bit of left turn, right turn, left turn we ended up at The Great Hall. 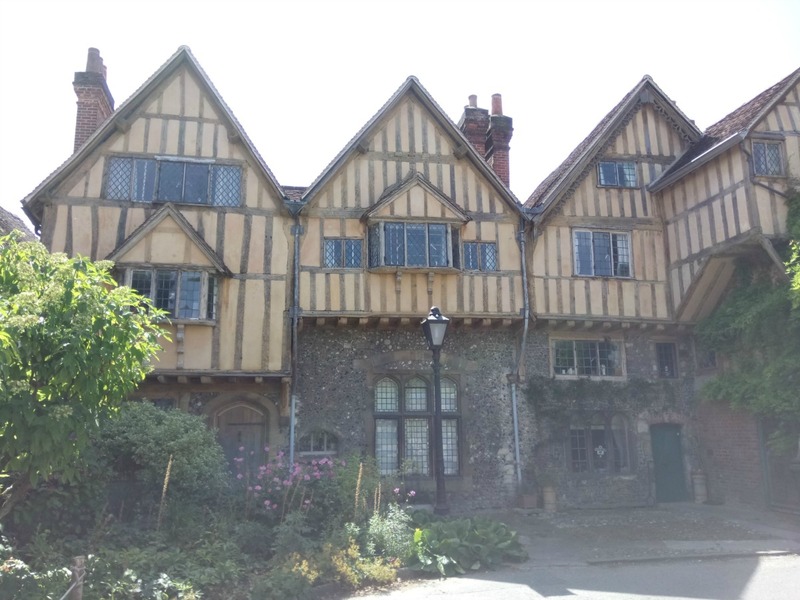 This 13th Century building was used as the main law courts up until the 1970s but is now open to the public for the very small entrance fee of £3. 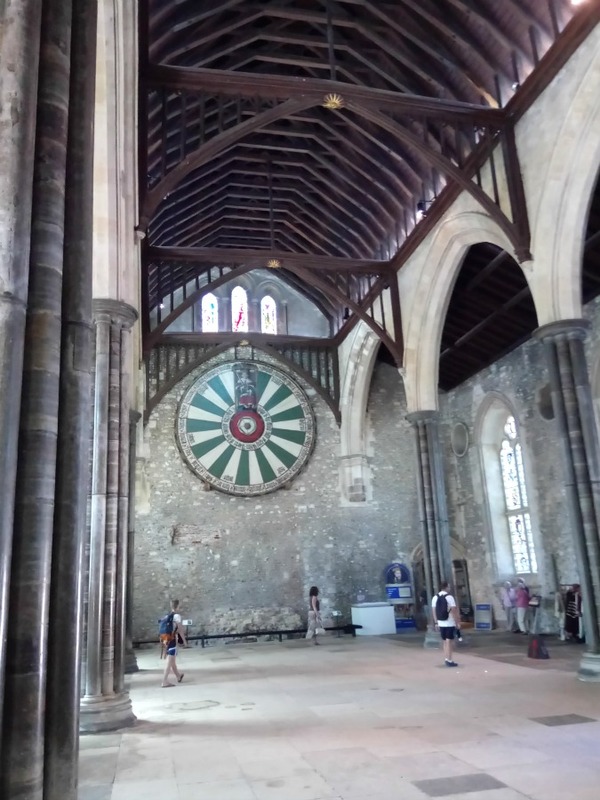 One end of the hall has huge sculptured gates that lead through into the new law courts and hanging on the wall on the opposite end is a huge circular table. 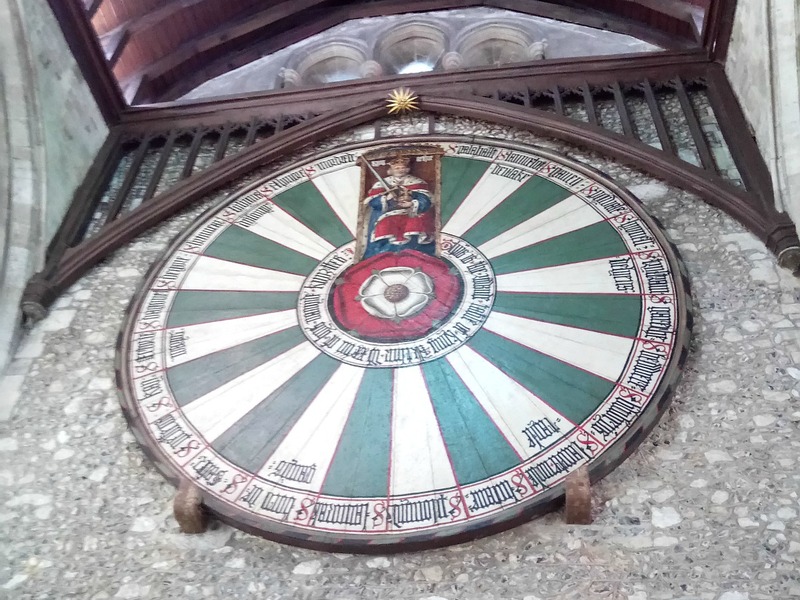 It is as old as the Hall itself but Henry VIII, being a fan of all things Arthurian, had the names of King Arthur’s knights painted around the edge, a tudor rose painted in the middle and a portrait of King Arthur (which looks uncannily like Henry himself). A short flight of stairs in side the Westgate brought us to a free museum which is housed in this former city gate and sometime debtors prison. A roof terrace gives a good view down the main High Street, although Jonno seems to have gone through some sort of looking glass. A walk further down towards the city centre brought us to the Cathedral. It dominates the skyline. In need of refreshment we headed to the Cathedral Rectory which is a very nice cafeteria/restaurant with a little shady courtyard at the front and garden to the rear. A lovely cool place to sit after a hot journey and walk. As we left the courtyard my eagle eye spotted a statue. 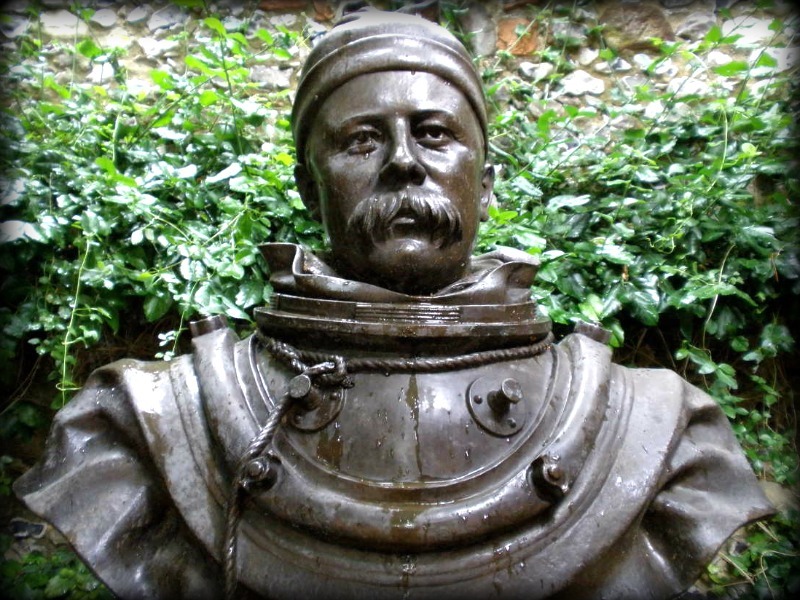 It was a bust of a diver in early diving gear with the name William Walker, “The diver who saved the Cathedral“. What was this all about? 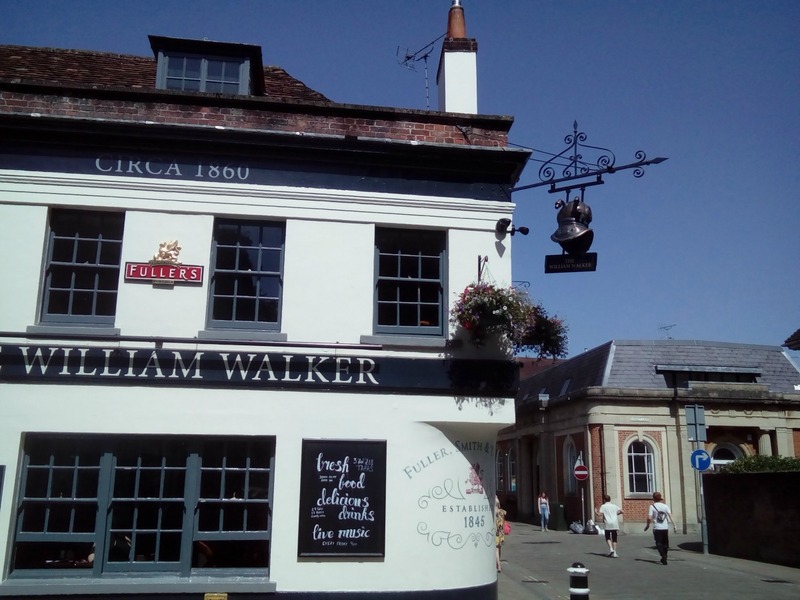 My curiosity was buzzing but it heightened even more when we walked across the Cathedral gardens and saw the William Walker pub. Who was this guy? Mental note made and research was required. 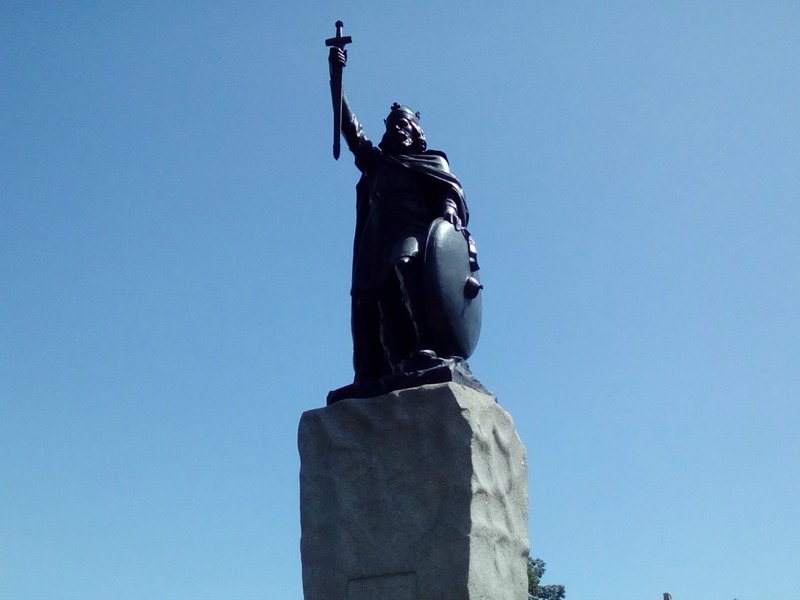 We walked further on down the High Street past the Buttercross, Guild Hall, Abbey House, King Alfred’s Statue and City Mill. 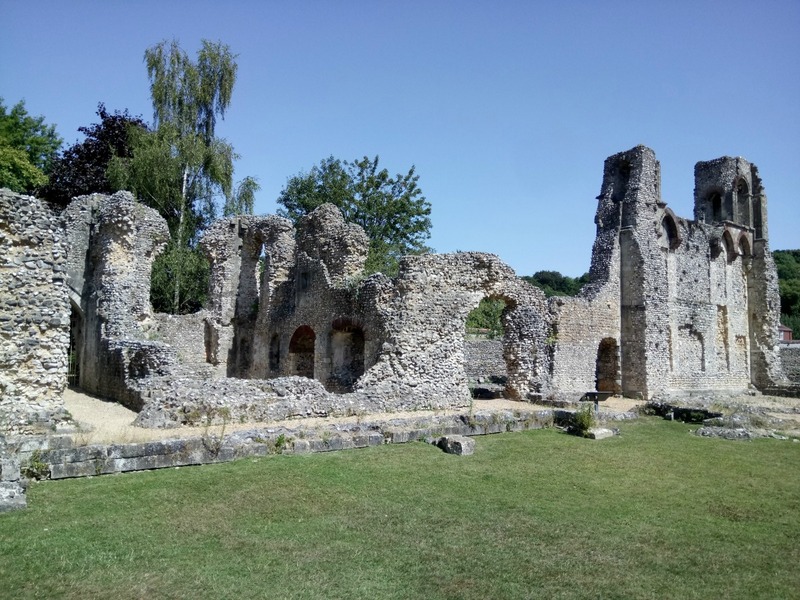 A short walk along the edge of the River Itchen and around the city walls brought us to Wolvesey Castle, know as the Old Bishop’s Palace. I think this was my favourite historic building. 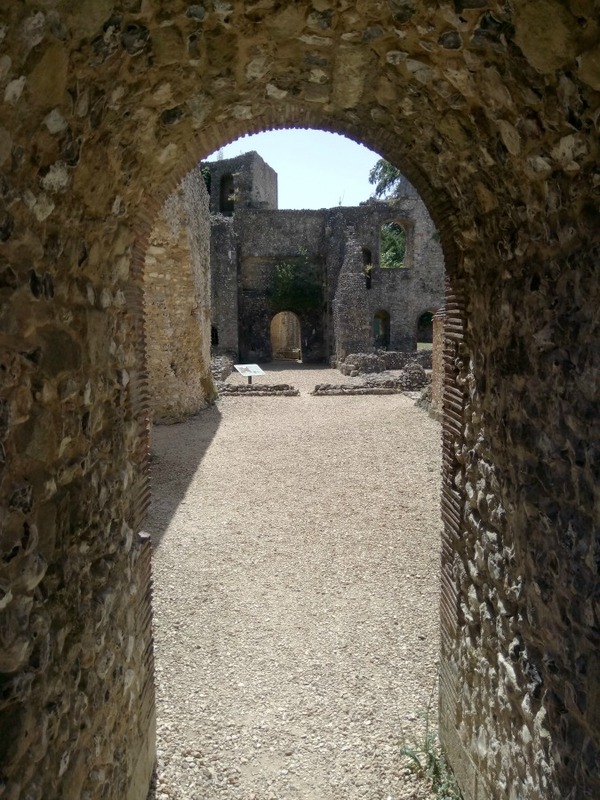 Despite it being a ruin, there was a feeling of grandeur and vastness that must have made it an impressive site back in the 1100s. In 1554 the wedding breakfast of Queen Mary (Henry VIII’s daughter) and Phillip II of Spain took place there. The majority of the castle was destroyed by in the English Civil War. 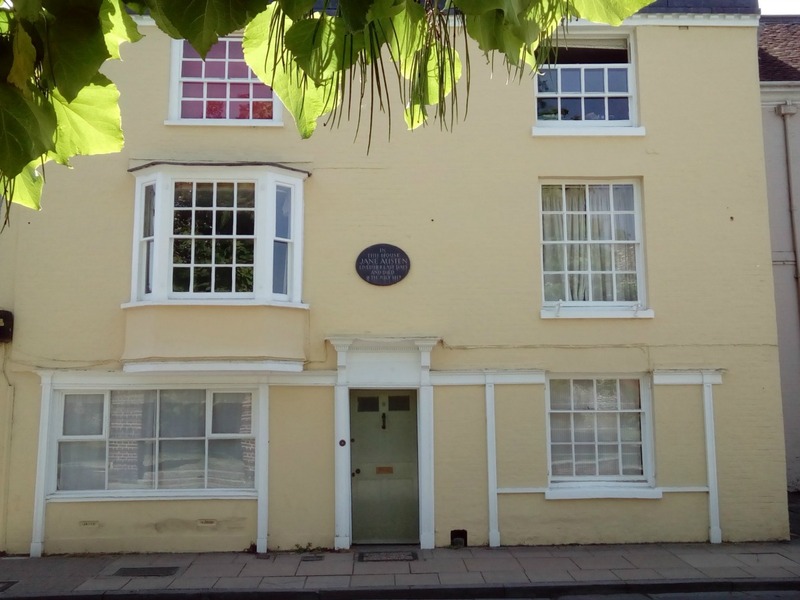 We continued our walk past the house where Jane Austen died after a short illness and onto St Swithin’s Church. 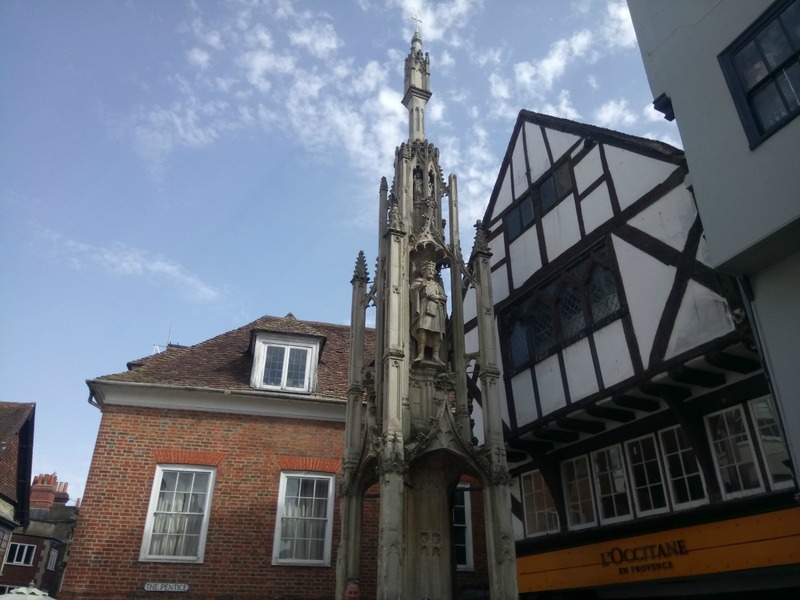 St Swithin was a bishop of Winchester but his fame comes more from the anecdote that if it rains on St Swithin’s Day (15 July) it will rain for 40 days and 40 nights. 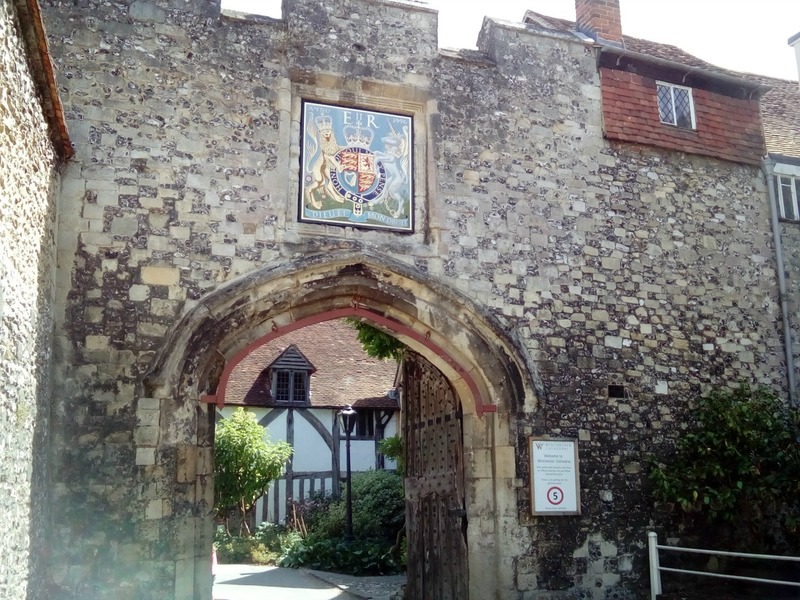 His little church sits on the city wall over the Kingsgate entry to the city. We seemed to pass endless beautiful timber beamed houses between the city walls and the Cathedral. It is somewhat overwhelming but impressive. All this exploring meant that refreshment was needed. Somewhere with a bit of history was needed. The Old Vine, a relative baby being only 18th Century, but on the site of palace from the 14th Century (visible in the cellars) would do the job. Perfect. So who was William Walker – the diver who saved the Cathedral? You have to forgive me this short history lesson. I have tried to be brief about each location in this place so full of history but this story I can’t resist retelling. Well, he was born in 1869 in Surrey and trained as a diver at Portsmouth Dockyard. 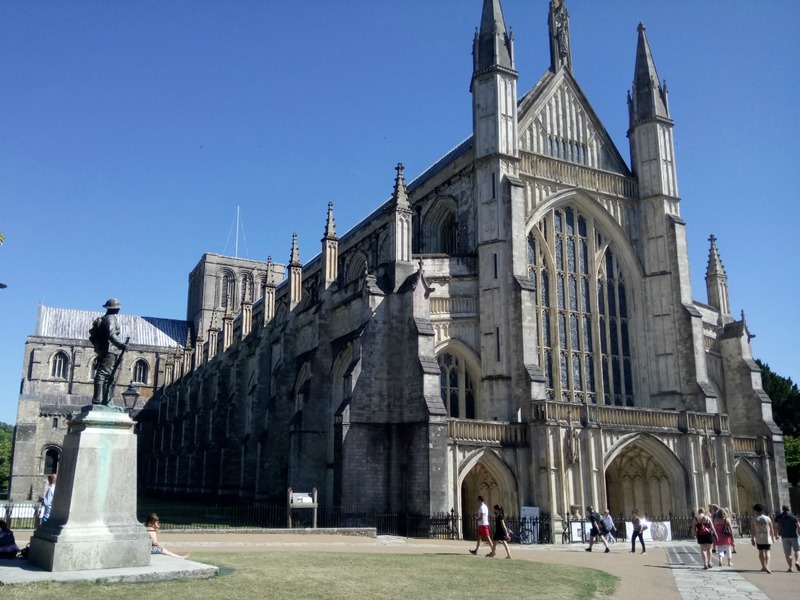 In 1906 Winchester Cathedral was sinking fast into the peat soil. For bricklayers to be able to build supporting walls the groundwater level had to be lowered without letting the building collapse. So for temporary support, 235 pits six metres deep were dug. William Walker worked six hours a day for five years in complete darkness to shore up the cathedral. He used more than 25,000 bags of concrete, 11,500 concrete blocks and 900,000 bricks. After Walker finished this massive project, the groundwater was pumped out and bricklayers were able to restore the damaged walls. If this wasn’t enough physical work, he also had a bit of a weekend commute. He would cycle home 70 miles at weekends and return by train on the Monday. Just for good measure he also carried out rescue work in a flooded mine in Wales, worked on the building of the first Blackwall Tunnel in the late 1800s and worked to develop accurate decompression tables for deep water diving and work in compressed air. A spooky connection for me personally because my Dad worked in compressed air on the construction of the second Blackwall tunnel and the Dartford tunnels. Despite all of William’s daring and courageous work it was germs that got him in the end – the Spanish Flu epidemic of 1918 that killed him. William Walker – definitely a hero in my book. I can’t finish without giving you this quiz fact. It is for those of you who are Gerry Anderson science fiction fans. Which character was, or should I say will be, born in Winchester? The answer is Paul Metcalfe who is Captain Scarlet himself. Due to arrive on 17 December 2036. What an incredible man William Walker was. To do all that is just amazing, how come he’s not a saint! He has a Member of the Royal Victorian Order but, as you say, should be more famous and at least have a bridge, street or park named after him in Winchester. Thank you. 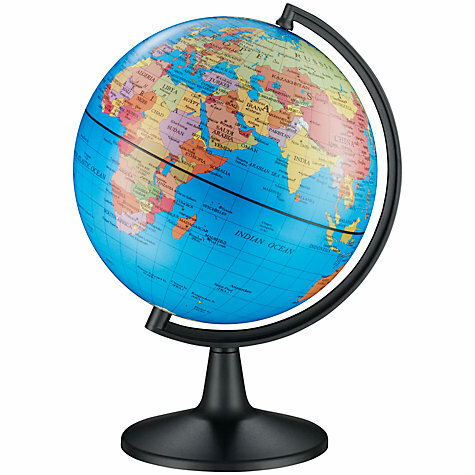 We loved it there but I had trouble keeping the blog post brief! 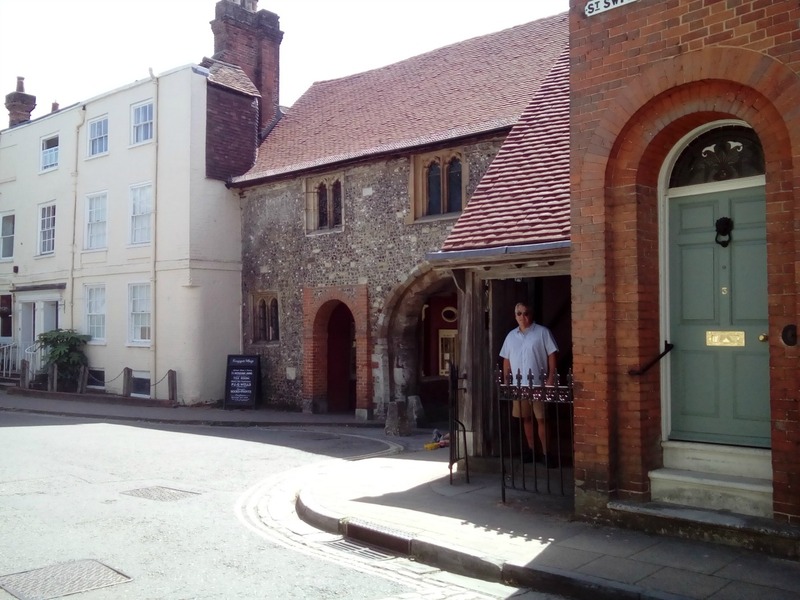 I really like Winchester, it’s a small city but offers a great deal and not over run with chain shops a few independents are still there. Glad you liked it. Loved it. I am sure we will be back. 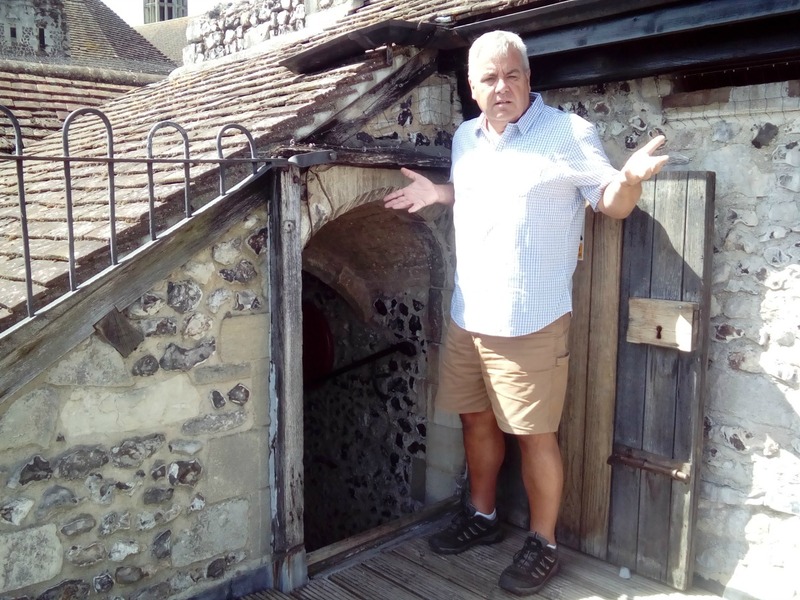 Gosh, I’ve just mentioned the fact we stayed in an AirBnb in Winchester in my post – wonder if it might be the same? You’ve got some great pictures there. 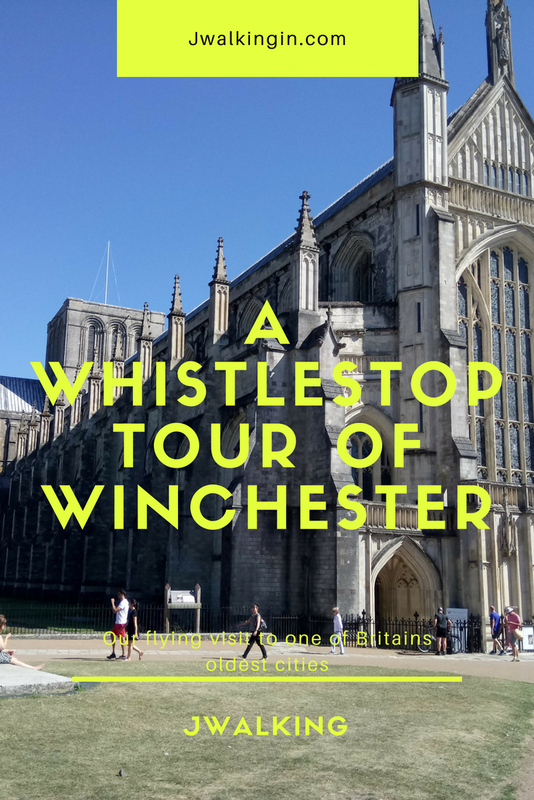 Other than our recent visit, I first went to Winchester as an 18 year old, while cycling from London to the isle of Wight. Your photo of the City Mill reminded me, as that was the youth hostel I stayed in. Back then, in the mornings you had to walk down some steps to the river with a bowl to get washing water! I don’t suppose you do now. All that washing in the River Itchen sounds more like my glamping extravaganza. So interested to hear it was a Youth Hostel. Loving the look of Winchester. 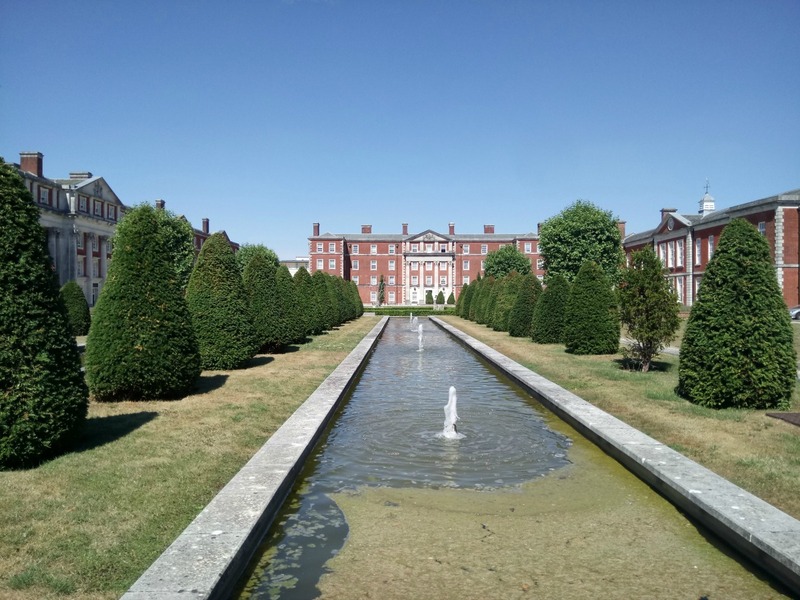 Worth a visit for a long weekend? Didn’t know you were such a fan. There is a whole back story of his family in Winchester. I always got called Joe 90 as a child. 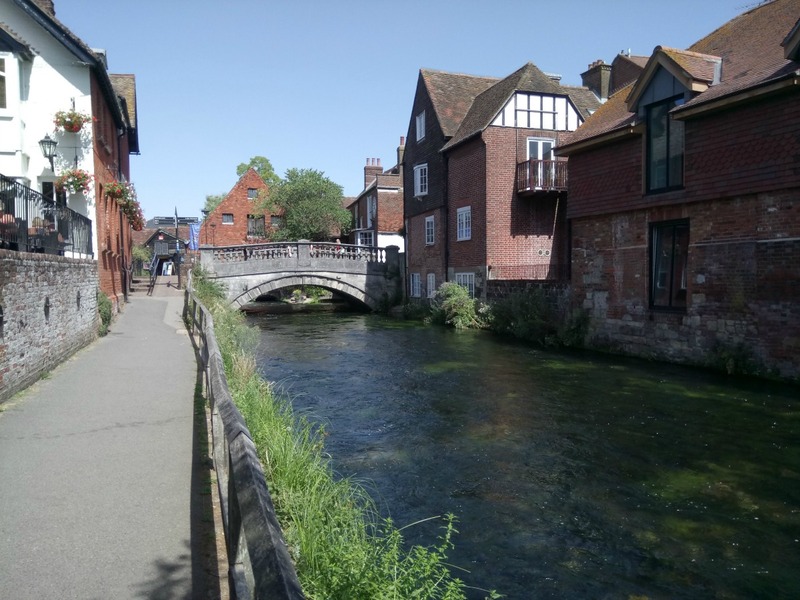 Winchester is definitely a great location for a long weekend. Not far from London but maybe combine it with a trip to Salisbury. The Ivy Restaurant in the High Street, Winchester looked your sort of dining establishment. Shame to miss the Open Days. Another visit is planned so maybe we can coincide with these in the future. I’ve only been there once. 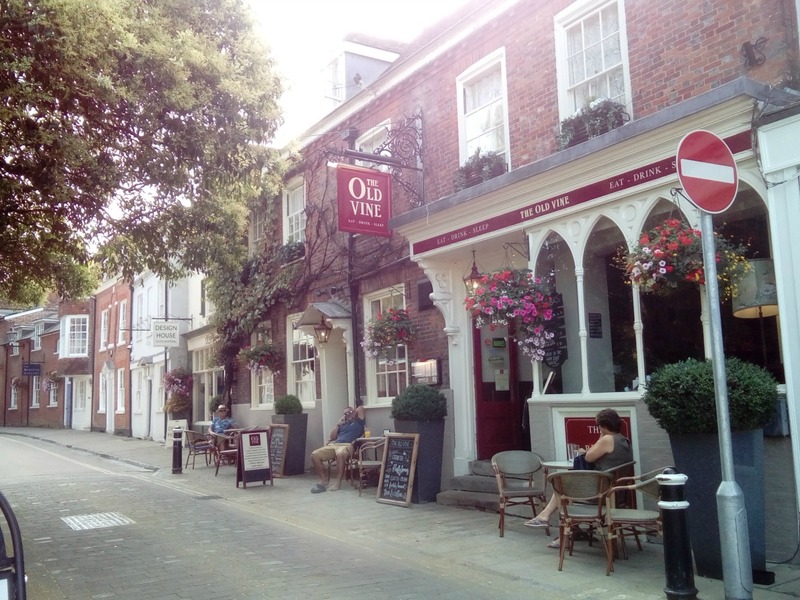 My husband’s cousin lives in Portsmouth and took me there to see the lovely boutique shops – indeed, not all chain stores for sure. I remember it as being a lovely quaint city, and I found a great shoe shop there. I’m not much of a shopper, but Winchestor, York, and Chester could be the exception to that. That Spanish Flu killed off so many. I believe more people died of that flu than were killed in the Great War. Not a shopper myself really but do love an independent store for whatever I’m buying. Staggering fact about the Spanish Flu and how unjust to have survived the war, or the risky profession of William Walker, and then be struck down. Thanks for the post you reminded me of our visit there. So much history and gorgeous to boot. We, like you, will always have great memories of Winchester. Another one of those places that is not far from our previous home but we never got to. 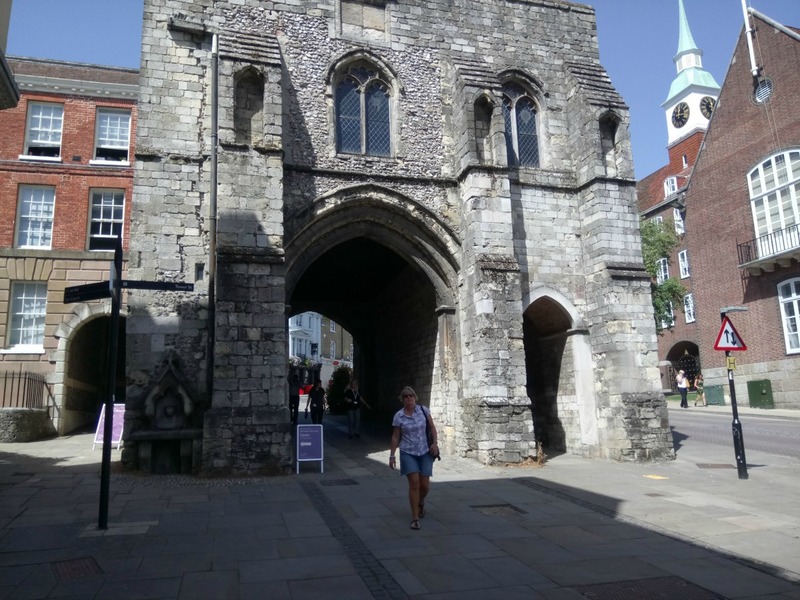 I love Winchester – we used to live there… it’s such a beautiful city and there are so many interesting places to visit (as demonstrated by your fab photos)! Glad it brought back happy memories. I am sure we will return. The great weather helped with the photos.